Some of what we think we know about the brain is flat-out wrong. When the truth is so mind-bogglingly awesome, there's no need to cling to myths! So here at The Brain Geek, I'm going to devote some time to debunking the nonsense that's out there. Here it is: Brain Myth-Busting! "You only use 10% of your brain." Heard that before? I have. Loads of times. It’s such a popular idea, it’s even in the movies. A typical plot might be: "Here, Joe Nobody. Take this pill! It will allow you to use the full 100% of your brain! Wow! Now you're psychic and can move things with your mind! Amazing!" ...or.... "That girl is a genius because she had radioactive accident which changed her DNA and now she can use more than 10% of her brain. And she's psychic and can move things with her mind!" According to pop culture, the fast track to superpowers is using the full 100% capacity of your brain. Now, I'm the first person to say that sci-fi/fantasy is awesome, but this is just nonsense! Why? Because we already use 100% of our brains. Last time I checked, I couldn’t move things with my mind. If I could, my breakfast would be cooking itself right now. It's not true. If you only used 10% of your brain, you'd be dead. Unless that 10% was your brainstem, in which case, you'd be a vegetable (see the parts of the brain post). Why this myth is so popular is no mystery. Most people want to be smarter, and who wouldn't want to move things with their minds? (must...make...breakfast....) How it got started in the first place is a more interesting question. 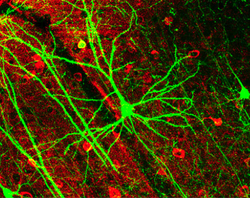 About 100 years ago, when scientists first started looking at brains under microscopes, they saw neurons. They soon figured out that neurons are important for processing information, making you conscious, allowing you to move your muscles, and all the other things neurons do. 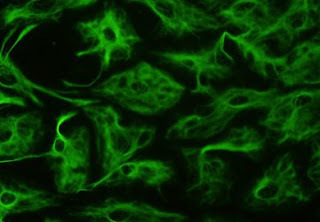 But most of the cells the scientists saw weren’t neurons, and these cells didn’t seem to do anything important. They named these cells glia, which means "glue." They looked at their slides and thought, "Wow, only 10% of the cells are neurons. The other 90% of the brain is glue. People only use 10% of their brains!" They were wrong. Glia are much more than glue. There are lots of different kinds of glia, each with an important job to do. Some form the blood brain barrier, which stops toxins in your blood from reaching your brain. Others make the cerebrospinal fluid which cushions your brain from injury (see this post for a fun CSF activity where you get to smash eggs). Still others keep the amounts of ions and neurotransmitters in your brain at the right levels, so that neurons can send electrical and chemical signals (for discussions on how neurons use ions and neurotransmitters to talk to each other, see this post and this post). Some insulate your neurons, allowing electrical signals to travel faster, just like the insulated rubber covering around an electrical wire. Others are part of the immune system, zipping around the brain eating up bacteria and dead neurons so that the rest of the brain stays healthy. An interesting factoid about glia is that the more neurologically complex an animal is, the more glia they have. Humans have more glia than any other animal. And Einstein – widely regarded as one of the smartest humans ever - had more glia in his brain than any other person we've looked at. Glia don't do any thinking - that's the job of the neurons - but having lots of glia around to keep the brain a clean and healthy place might be part of the reason why human neurons are so good at thinking. The myth started because so little of our brain is actually neuron. The rest is glia. But does that mean we only use 10% of our brain? No! We use those glia. They keep the brain healthy and moving quickly. We use 100% of our brains, all the time. And if we increased the percentage of neurons, so that it was more than 10% (which would make glia less than 90%), would that make us smarter? No! Because you needs lots of glia to have a smart brain. So next time someone says to you, "You're interested in the brain, right? Is it true we only use 10%? ", feel free to show off just how much of your brain you're using, and tell them all about glia. Great article! I've been guilty of believing that misconception. Way to debunk it! I knew that the ten percent was wrong but this article explained in a broad way and now I can explain it correctly. Thank You.